Indian Gooseberry, also known as Amla, is a fruit which belongs to the Euphorbiaceae family. It ripens in wet, wooded areas during the fall season. The sour fruit contains a high concentration of vitamin c and is sacred in Indian culture because of its numerous health and beauty benefits. 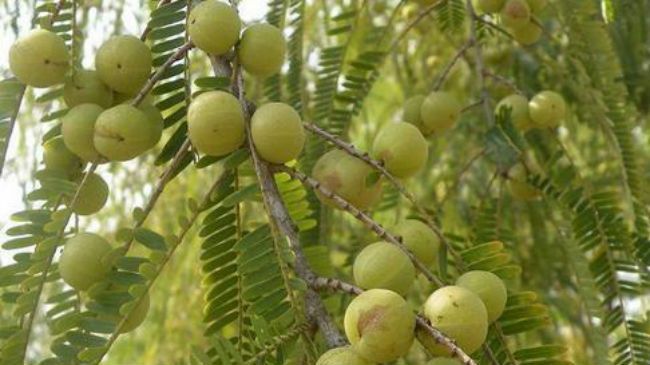 What exactly can Amla do for you? Indian Gooseberry can be found in many hair ingredients marketed for hair growth. In oil form, it may reduce the chance of hair loss and baldness. The carotene content of Amla blocks free radicals from damaging hair follicles, affecting certain hormones. If consumed on a regular basis, you may find fewer or less severe menstrual cramps due to the various vitamins and minerals in the gooseberry. This fruit is a natural diuretic, meaning it increases urination whenever consumed on a regular basis. This can be extremely helpful in getting rid of unnecessary waters, salts, and toxins in your body. Your kidneys will thank you! Amla reduces free radicals throughout your body, slowing down signs of aging and wrinkles. Indian Gooseberry can give your body an extra jolt of vitamin c, which works wonders for fighting against bacterial infections and viruses. Consume it as a powder or butter in your food diet. Banyan Botanicals has Certified Organic Amla powder sold online here for $24. You may also purchase the fruit in a capsule form, online here for $12.